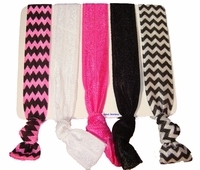 5 Pack of Elastic No Tug Hair Ties Add a little splash of color to all of your outfits! These fun hair ties are made from a soft and stretchy material that has been hand-dyed and knotted. They are so Awesome! - Gentle on your hair - these hair ties don't pull and dent your hair like the traditional ponytail holders. You can also wear them as bracelets or anklets. Our hair ties come in an erray of colors - try your school colors or favorite sports team colors. Share and trade them with your friends today!